I used to dread sewing anything by hand. Before I started machine sewing regularly, my hand sewing experience was limited to embarrassing attempts at reattaching buttons. But, then! 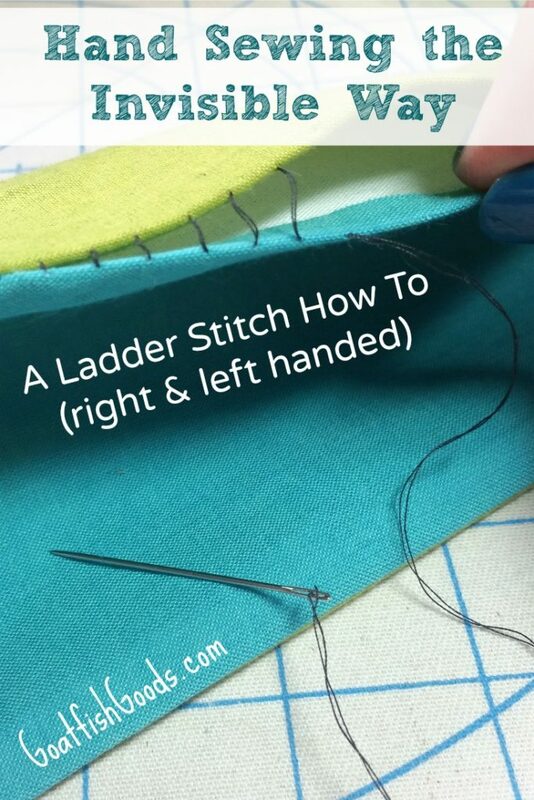 I discovered the oh-so-awesome ladder stitch, which is also called the hidden stitch, the slip stitch, and the blind stitch. 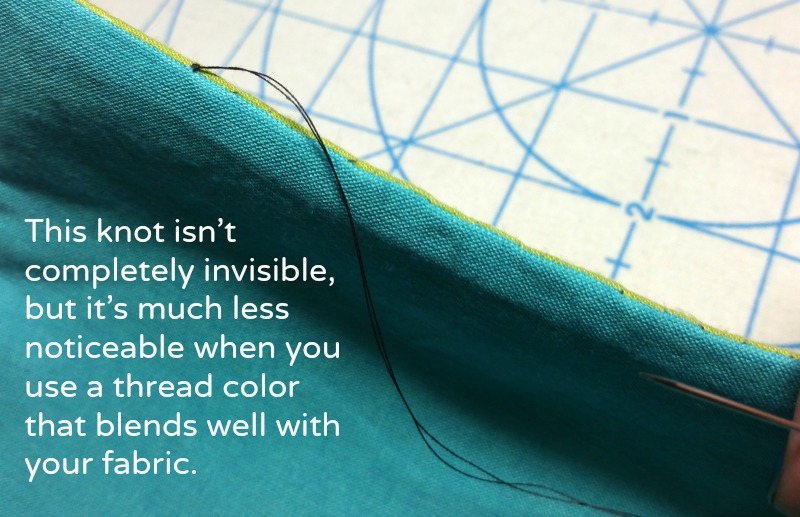 It’s also referred to as the invisible stitch, which is entirely why it’s my favorite. I don’t have to fret whether my stitches look good or not because no one will ever see them. You can use this stitch when hemming a garment, closing openings in pillow covers and softies (stuffed toys), when binding, doing applique, etc. But for the purpose of this tutorial, let’s just say you have a turning hole on a bag or pouch you need to sew shut with an invisible seam. As a lefty, I had a hard time initially figuring it out because I could only find photos with a right handed bias (story of my life). That’s why I’d like to provide both the left AND right handed perspectives here in one place. One more thing before we dig in… You may be here for this tutorial because you purchased my new PDF pattern, The Journal Sleeve. If this is the case, thank you… No, really, THANK YOU! I hope you had fun making one! If you have no clue what a Journal Sleeve is, visit my big announcement for pattern information and loads of pics. Or, go straight to my Etsy shop to purchase the pattern and get started making one for yourself! 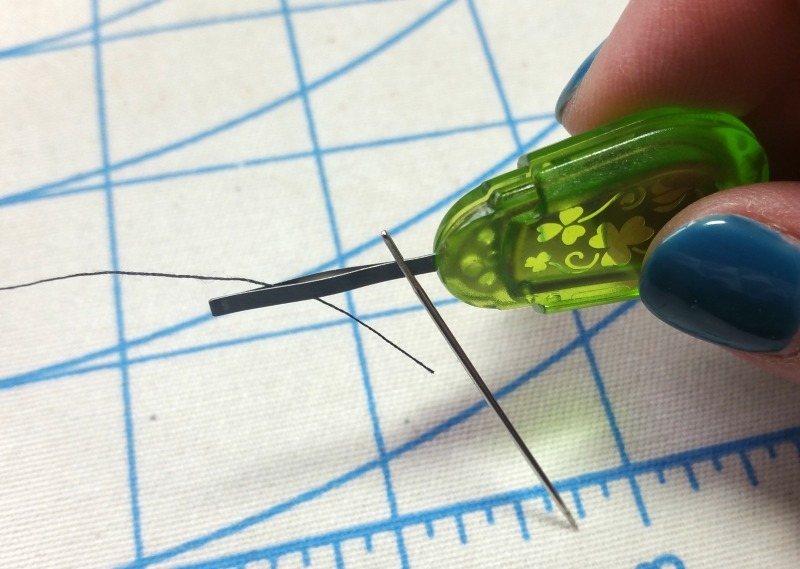 A hand sewing needle: Any hand sewing needle will do, but I like embroidery needles because they have a large eye which makes them easier to thread. I usually just pick up a variety pack with sizes 3-9. Thread: It doesn’t have to be anything special. Just grab the thread you used on your machine when constructing your project. Since your goal is invisibility, it’s best to go with a thread color that blends well with your fabric. I’m using a contrasting color this time for demonstration purposes. A needle threader (optional): You’d think with the large eye of an embroidery needle, I’d be fine without a threader. Sadly, my old eyeballs sometimes need both the large eye AND my threader. Here’s the one that’s made my life a little easier. The first few steps apply to both right and left handers. I’ll let you know when to go your separate ways. Let’s begin with the prepping of your project. My (pretend) project is green on the front and teal on the back and has a 3” opening which needs to be stitched shut. 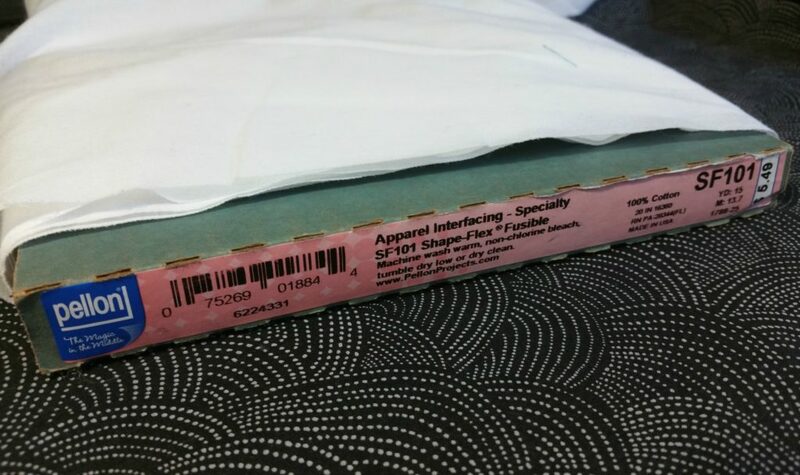 I’ve interfaced both fabrics with a mid-weight fusible interfacing (SF-101) simply because this is the thickness of fabric I often work with when closing bag openings. 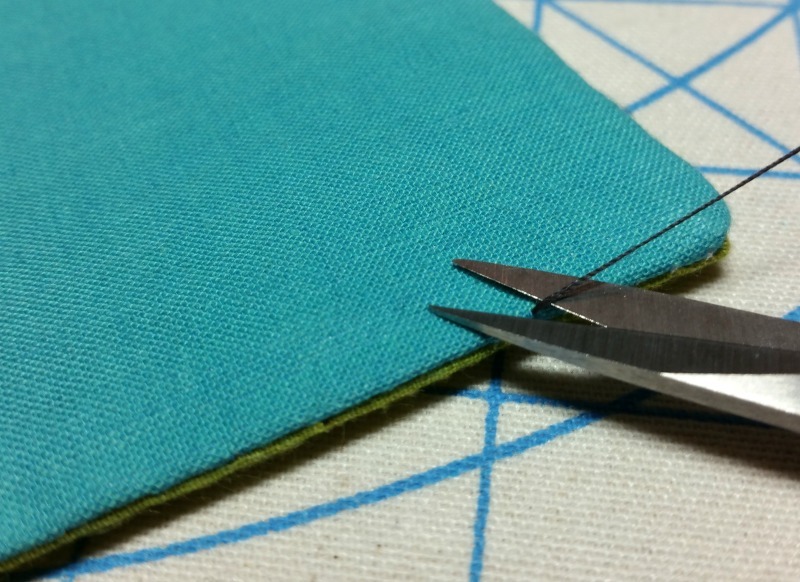 Regardless of the thickness of fabric, your opening will need to have two folded edges that have been pressed flat. This is important because the crisp crease of the folds will actually guide your stitches resulting in a tidy finish. Now, unwind your thread until it is approximately the length between your fingertips and your shoulder when your arm is outstretched. Mine usually ends up to be around 26”. Thread your needle by hand or with a needle threader. Insert the wire loop through the eye of the needle and stick your thread through the wire loop. Now, simply pull the wire loop back out of the eye until the tail of the thread is through the eye and a few inches long. For added strength, we’ll be working with a double strand. Pull on one side until the ends are even. Now we need to tie the ends together in a knot. If you are unfamiliar with the very handy and helpful Quilter’s Knot, take a look at this video tutorial by Easy Sewing for Beginners. It’s a clear demonstration and it provides both the left and right handed technique. Love that! The video begins with the right handed version and the left handed version can be found 45 seconds in. 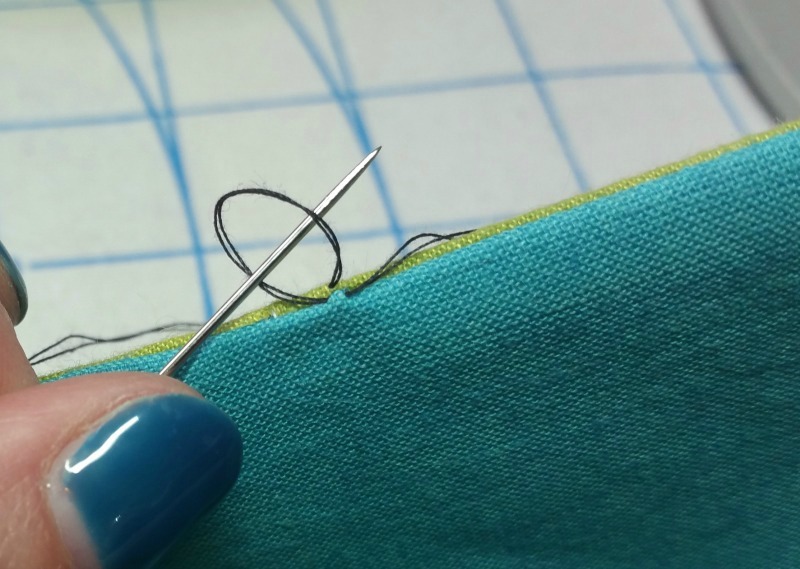 With your project prepped and your needle threaded, let’s get to that invisible stitching! We’ll start with you left handers. Right handers, click HERE. Ok, left handers! Hold your project so that its front is facing you and the opening is on top. Remember, the front of my project is green. First, let’s hide the knot. 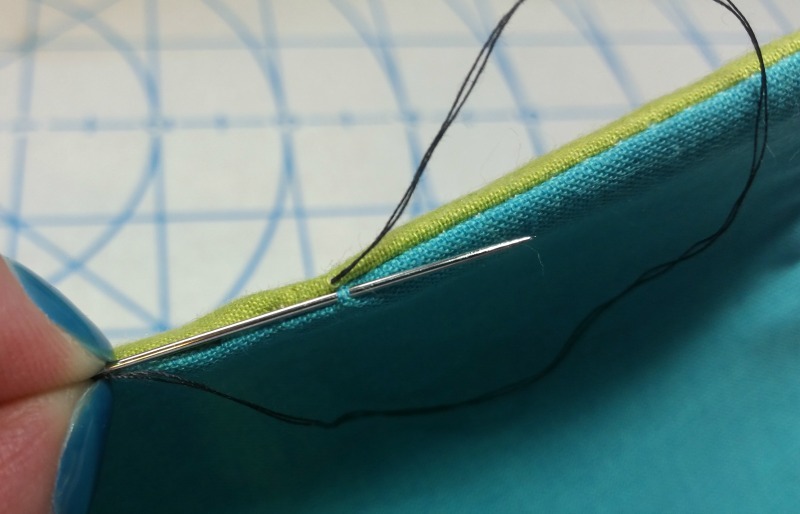 Insert your needle into the right side of the opening and push it out through the top of the folded edge closest to you (the front fabric) just outside the point where the opening begins. Pull the thread until the knot catches. The knot should now be completely hidden inside the opening. Next, pin the opening shut to keep the folded edges nicely lined up. 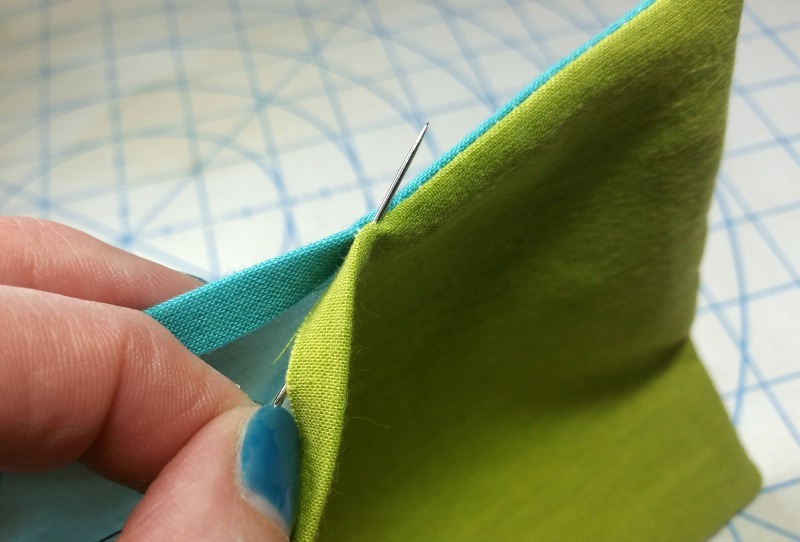 If your fabric is too thick for pins to handle, use Wonder Clips instead. Turn your project around so its back is facing you. Once more, the back of my project is teal. The knot you just hid away should now be on your left. 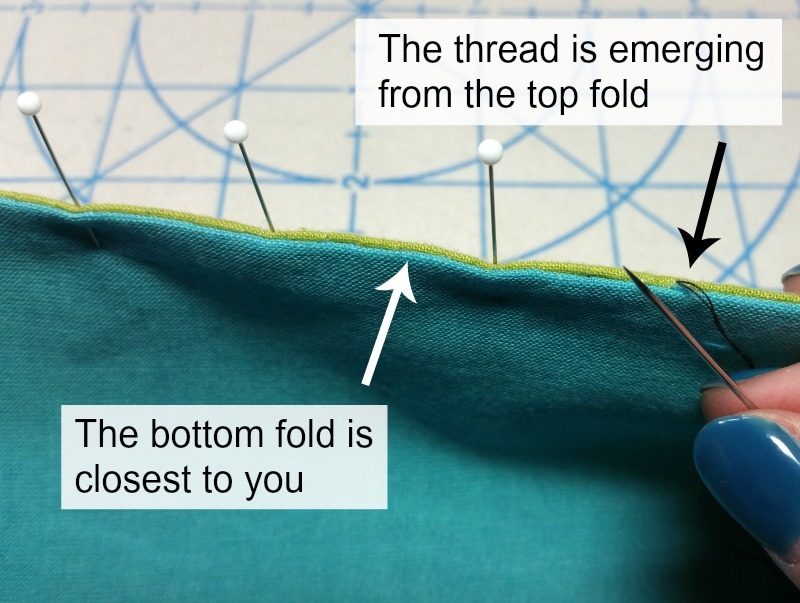 Notice you have a top fold (where your thread is) and a bottom fold that is closest to you. You’ll be stitching from left to right. 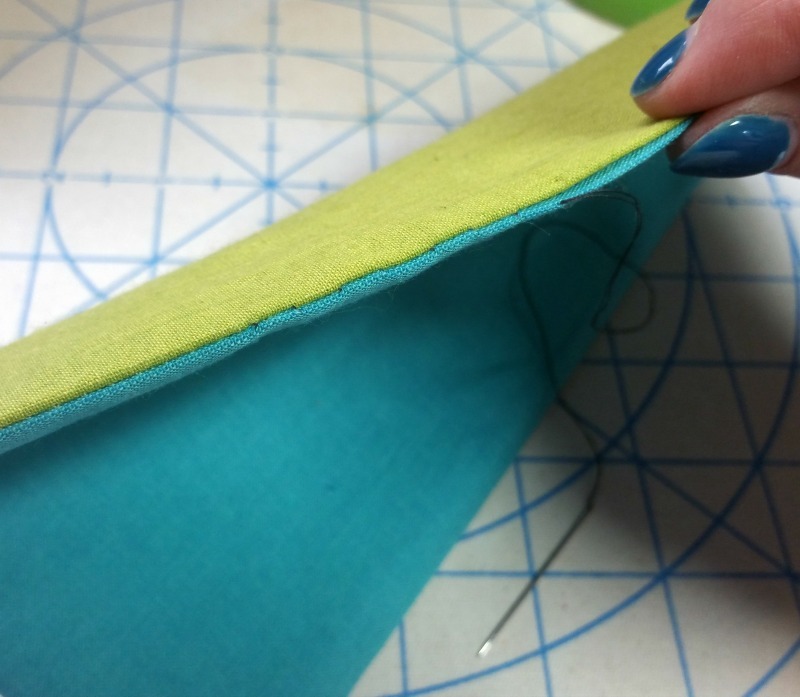 Next, insert your needle into the bottom fold directly across from where the thread came out before. 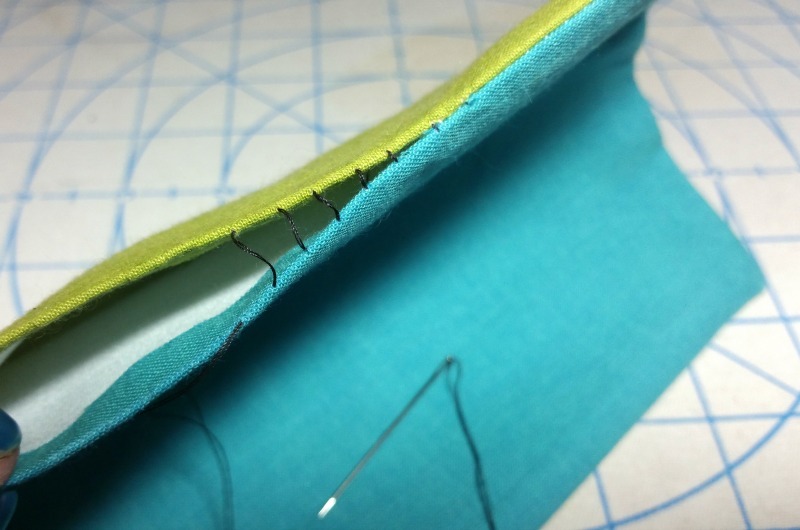 Let the needle follow the crease of the fold and take a stitch that is about 1/4″ long. 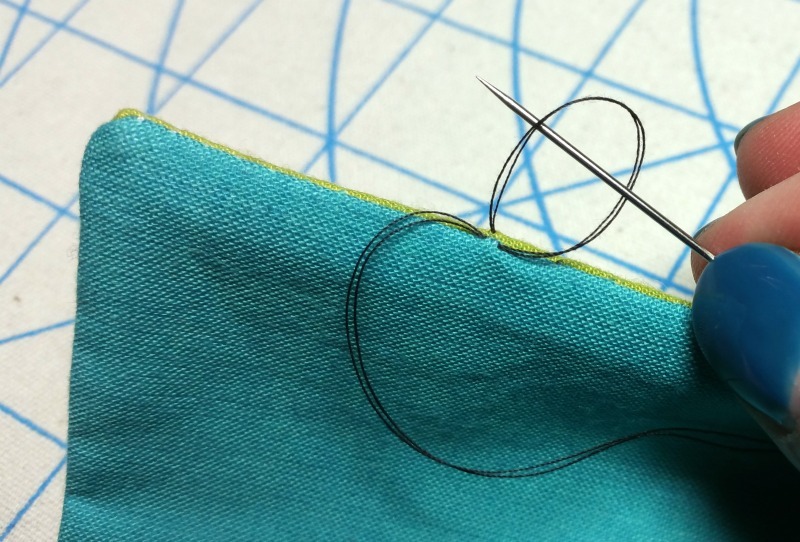 Push the needle out through the crease of the fold and pull the thread through gently. 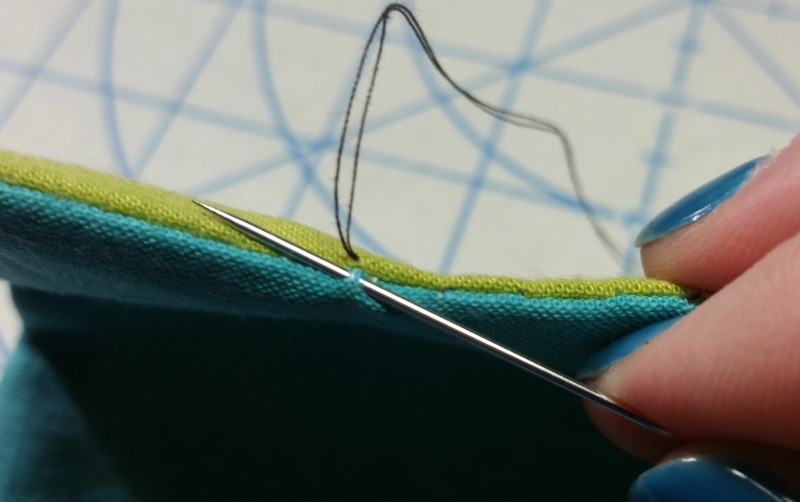 Try to keep a somewhat consistent stitch length as you make your way across the opening, but perfection is not required! Now insert the needle into the top fold directly across from where the thread came out on the previous stitch. As before, follow the crease of the fold and take another stitch about the same length as your first one. 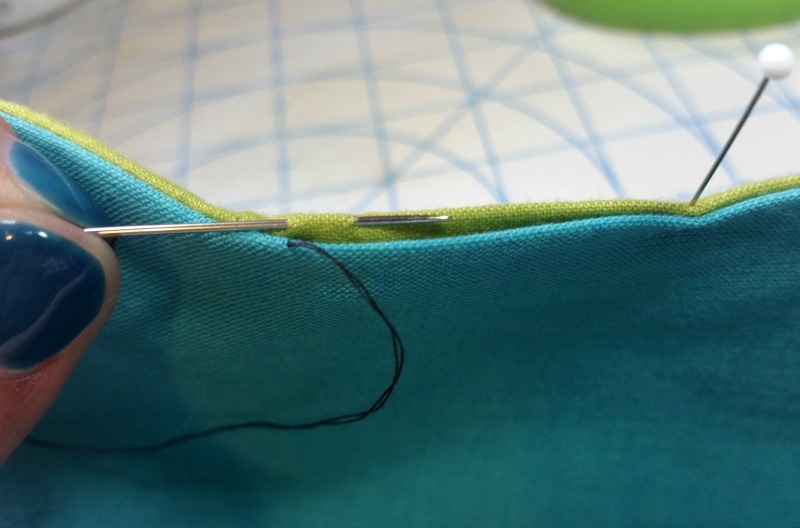 Continue your stitches back and forth across the opening. Pull your thread taut (not tight) every 2 or 3 stitches. When the stitches are loose, you’ll see how they resemble rungs on a ladder. Then, as you pull the thread, the seam will close with your cool, invisible stitches. Be warned, though… if you pull too hard, the thread will break, you’ll swear a little, and then you’ll have to start over! To get the best result, make sure you are starting each stitch straight across from where the thread came out from the previous stitch. NO diagonal jumping from fold to fold! 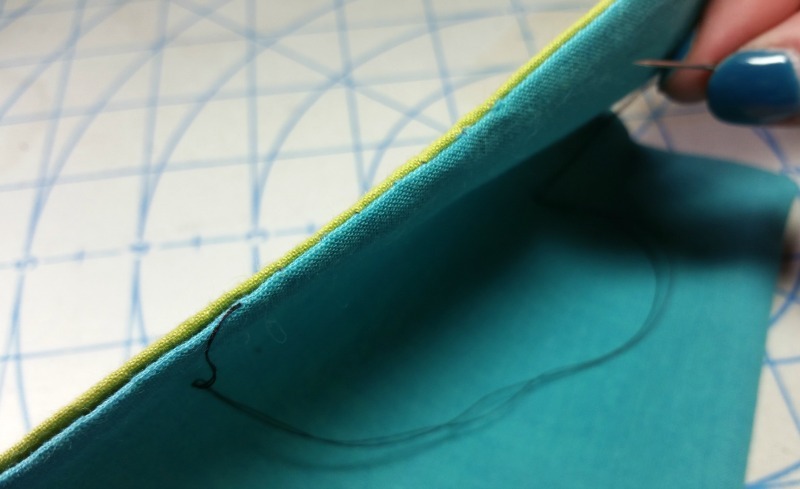 Also, to keep things invisible, keep your stitches along the very top of the folded edges so the fabric doesn’t dimple when you tighten your stitches. 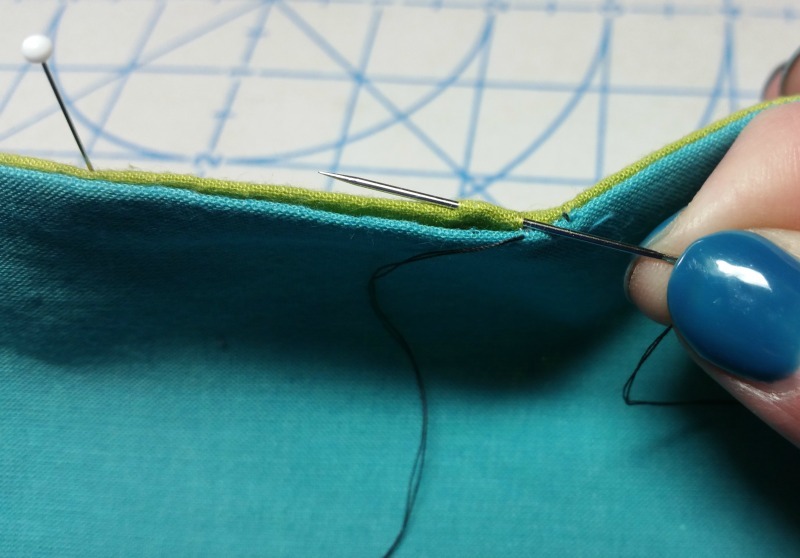 Your last stitch should emerge at least 1/8” past the end of the opening. 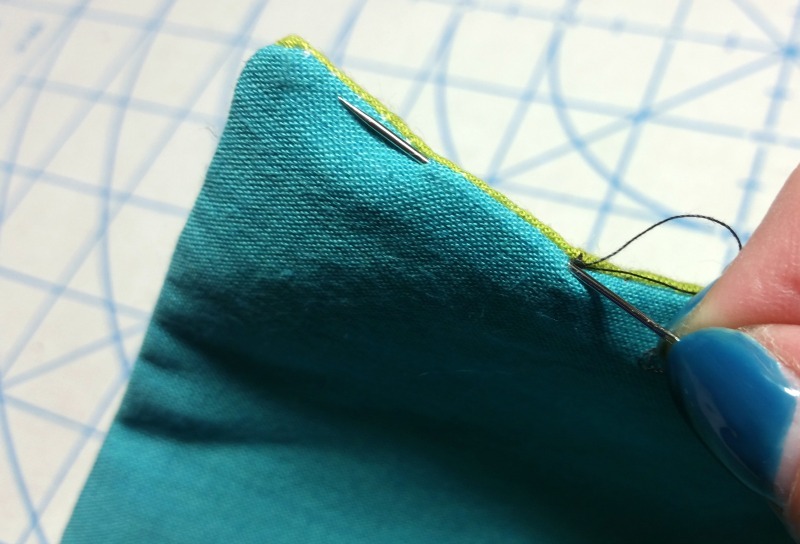 After you make sure your stitches have been tightened up and you are satisfied with your masterfully handsewn seam, pick up a tiny bit of the fabric directly across from where the final stitch emerged. Pull your needle through leaving a small loop of thread and stick your needle through it twice before slowly pulling it tight (to avoid tangling). 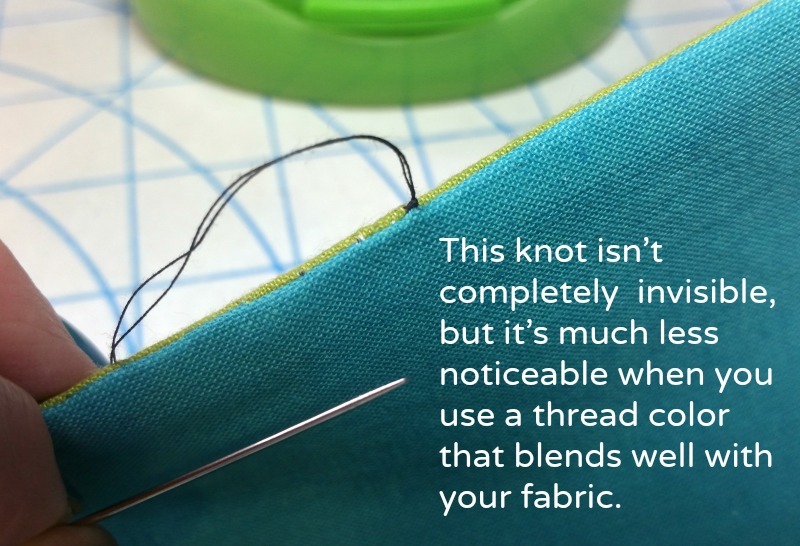 To hide the thread tails, stick your needle down right next to the knot and come back out a little further down the crease of the fold. Pull on the thread slightly and carefully snip it very close to the fabric. Once it’s cut, it will draw back into the fabric and disappear. I like to give the seam a final press at the very end so it’s nice and flat. And you’re DONE! I hope you enjoyed ladder stitching and that you love your new powers of invisibility. Ok, right handers! Hold your project so that its front is facing you and the opening is on top. Remember, the front of my project is green. First, let’s hide the knot. 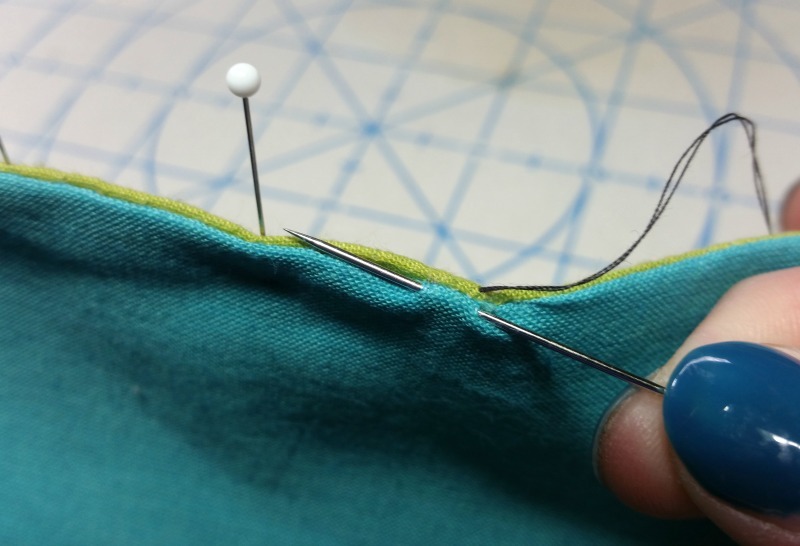 Insert your needle into the left side of the opening and push it out through the top of the folded edge closest to you (the front fabric) just outside the point where the opening begins. Turn your project around so its back is facing you. Once more, the back of my project is teal. The knot you just hid away should now be on your right. 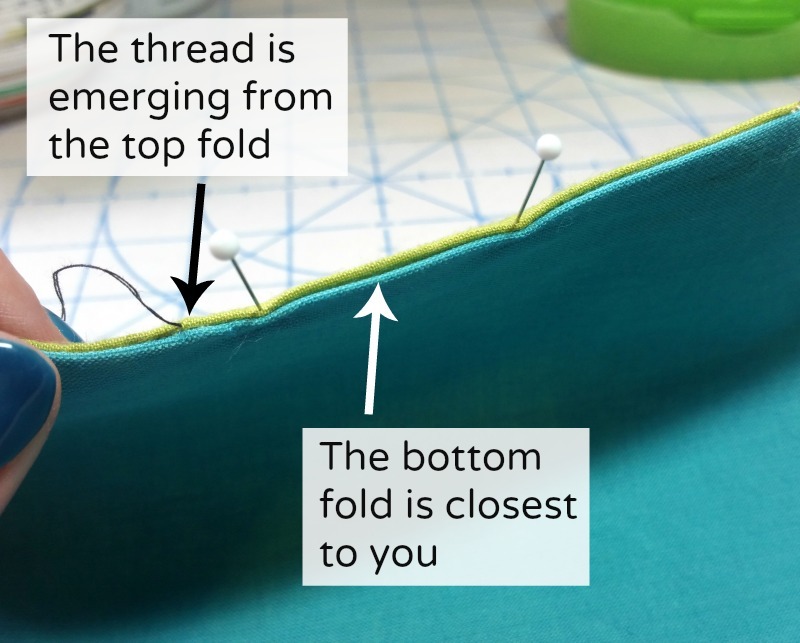 Notice you have a top fold (where your thread is) and a bottom fold that is closest to you. You’ll be stitching from right to left. Continue your stitches back and forth across the opening. Pull your thread taut (not tight) every 2 or 3 stitches. When the stitches are loose, you’ll see how they resemble rungs on a ladder. So… you’re the new kid. You’ve decided to join this wonderful world of modern sewists. It’s a little overwhelming, right? It sure was for me when I first started out (not too terribly long ago!). From the very start, I relied tremendously on blog and YouTube tutorials when I was unsure about a specific skill or technique. And let’s just say I was unsure A LOT. Luckily, in this day and age, becoming a competent, self-taught sewist is completely doable! 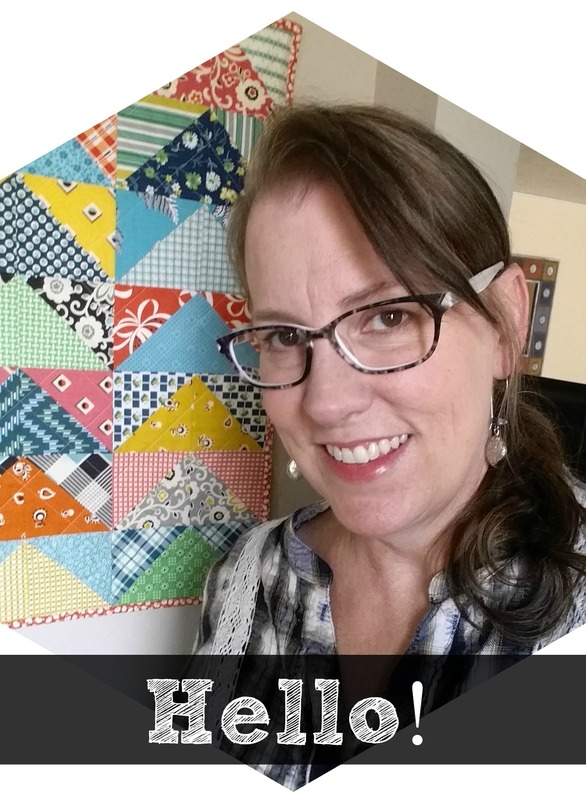 I encourage anyone new to the sewing world to be curious, determined, and resourceful… all the answers are out there in this big, wide, interwebbed world. I’d say one of the most important things is to be patient with the process AND with yourself! 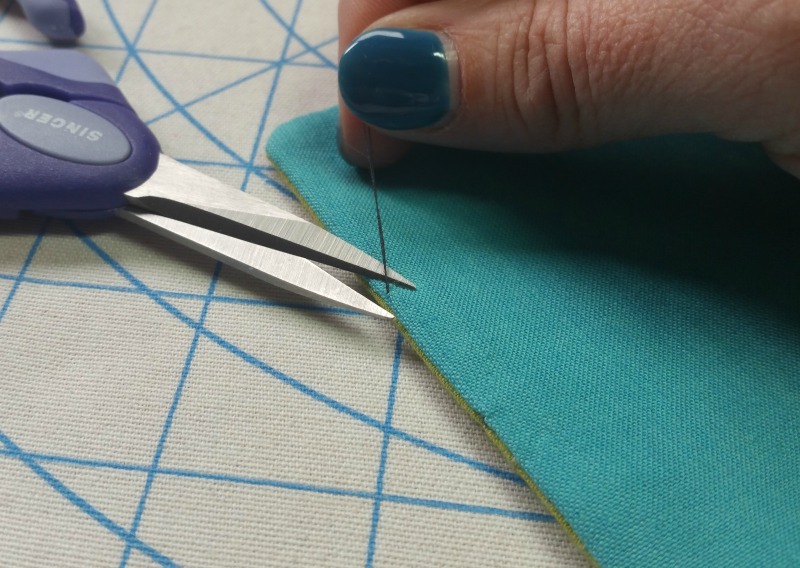 You’re more than likely to face thread tension problems, cutting mistakes, confusing patterns, broken needles, bird nests (when your thread gets all bunched up), skipped/uneven stitches, and a fair amount of seam ripping. There may be projects that’ll leave you frustrated and deflated. It’s also safe to assume you’ll compare yourself and your sewing to others and decide you don’t measure up in one way or another. We all do that! Consequently, it may be tempting to stash your machine in the back of the closet and decide sewing isn’t for you. I sure hope you don’t, though. I assure you, it gets easier and more fun as you improve your skills with experience and practice. Stick to simple, beginner-friendly patterns at first. Be sure to check out Michelle Patterns and Dog Under My Desk when you’re looking for your next project. They both write exceptionally thorough and well-photographed patterns perfect for the beginner. Of course, I’d love for you to try out my Journal Sleeve pattern which is now available HERE in my new Etsy shop! It’s ideal for the brand new sewist, as well. For more info and loads of Journal Sleeve pics, visit the big announcement. Regardless of your pattern choice, do yourself a favor and make accuracy your top priority even though it takes more time. You’re more likely to enjoy yourself and you’ll be happier with your finished items (which is the whole point, right?). I’ve put together a list of a few things you might find helpful if you’re new to sewing. Remember, though, no one resource will be completely comprehensive… that’s why Google is your friend. If you find yourself with one of the above pre-cut bundles and you don’t know what the heck to do with it, do an internet search for projects deemed “friendly” for your particular bundle. For example, search “charm pack friendly” or “charm pack patterns” to find ways to use up your charm packs. Visit your local quilt shop and you’ll see baskets of little folded pieces of fabric called fat quarters. Their cuteness is so hard to resist! In addition to the appealing price, there are several good reasons to stock up on fat quarters. It’s only one fourth of a yard of fabric, but it’s a nice versatile chunk, as opposed to a long, skinny strip. You’ll see more of your print, especially if it’s a large-scale print, and you also get more fabric along the selvage, which is the finished edge of the fabric that keeps it from unraveling. 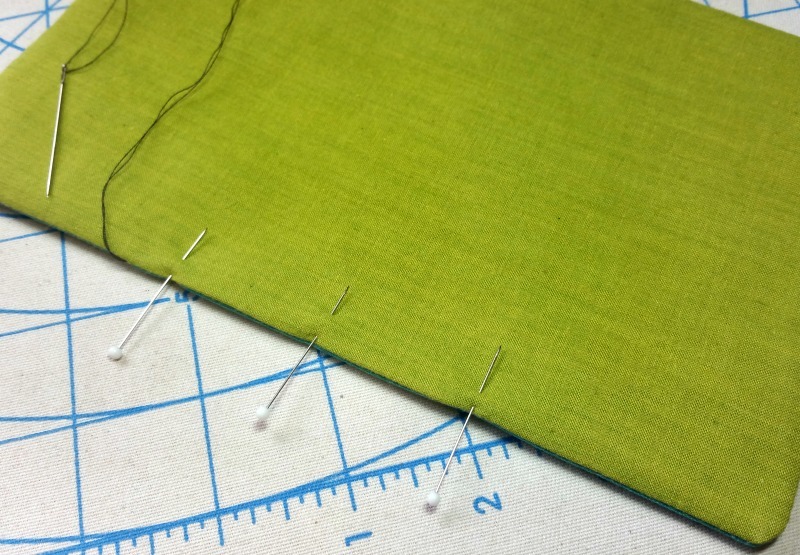 This length of fabric along the selvage has less stretch and is more desirable to work with. Most often, I use my Olfa 45mm blades. My Fiskars 28mm blade comes in handy, though, when cutting out curved pattern pieces. Some rotary cutters allow you to switch the blades to the right side (like in the pic) if you are left-handed. Taking the time to make sure your pieces are measured and cut accurately is essential. It’s incredibly frustrating to sew a project when your pieces don’t fit together properly. If you’ve never used a rotary cutter to cut fabric, you’d be amazed by how much more accurate it is than using a pair of scissors. Rotary cutting is also a huge time saver. 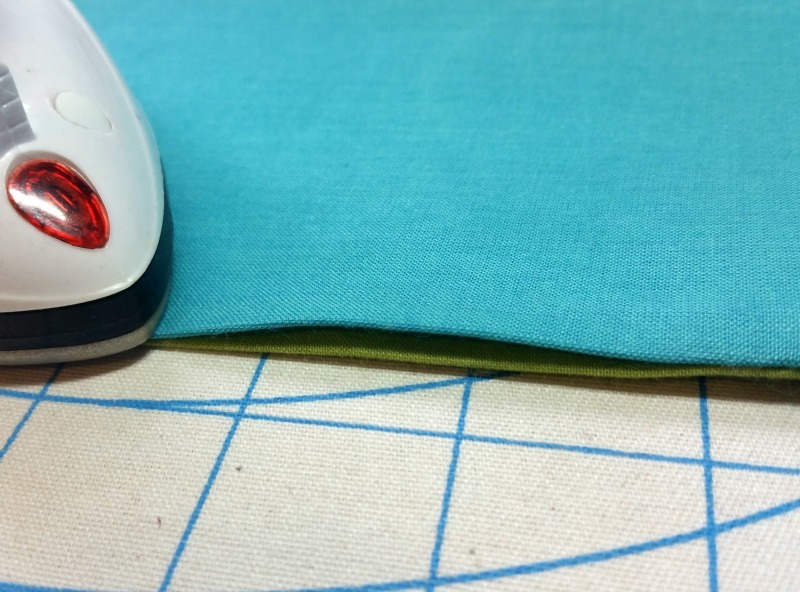 I firmly believe a rotary cutter, self-healing cutting mat, and a clear non-slip acrylic ruler are must-haves if you plan to sew regularly. When rotary cutting, learning the technique is important, but it’s probably more important to consider the safety issues. These blades are SHARP! Do your research and practice before you try out your new skills. 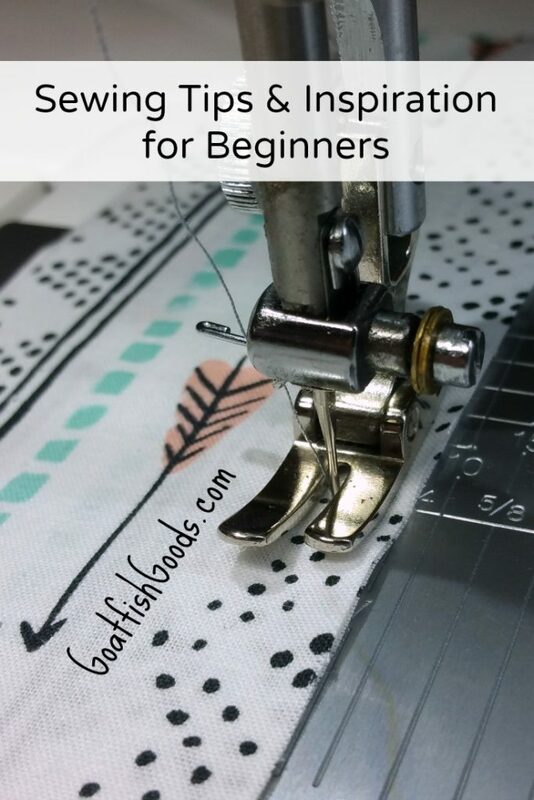 There are loads of blog and video tutorials out there and, fortunately for southpaws like me, there are even resources for left-handed sewists. And then, once you’re ready to take the plunge and rotary cut your first project, remember to measure TWICE and cut ONCE! We hear this all the time, but it’s a habit with a big pay off. 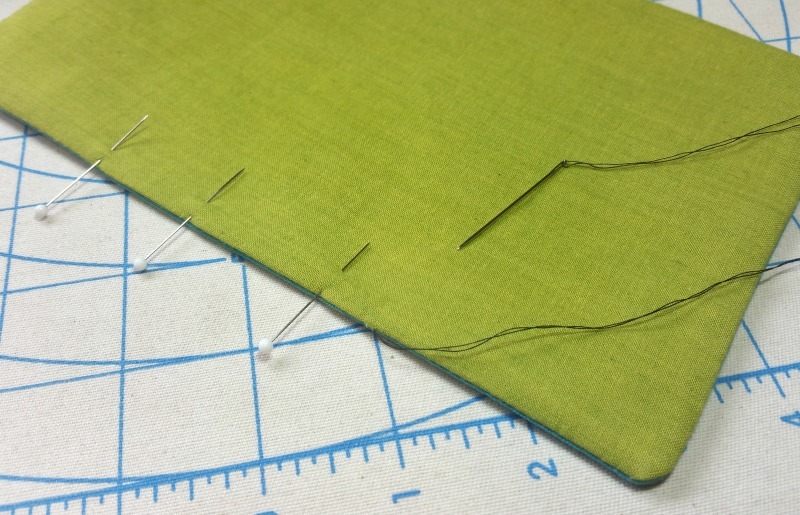 After you’ve been sewing for a while, it’s likely you’ll branch out with a variety of ruler sizes and cutting mats. You’ll have a better feel by then what works best for the kind of sewing you want to do. My favorite rulers are: 6″ x 24″, 4″ x 14″, and 3.5″ x 3.5″. When it comes to cutting mats, I work daily with a 24″ x 36″, I travel with a 12″ x 18″, and I absolutely LOVE my super cool 13″ x 13″ rotating mat. 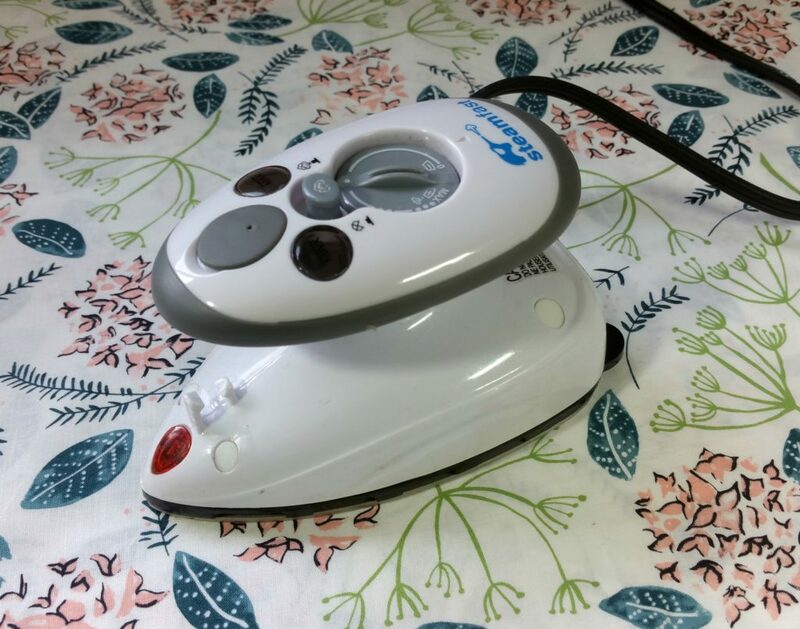 My favorite iron for sewing is the Steamfast SF-717 Home-and-Away Mini Steam Iron. Ironing clothing has really become a thing of the past for me, but my little iron still gets a daily workout. It’s an absolute essential tool in my sewing arsenal and there are two distinct ways it gets put to use. When you iron fabric, you move the iron back and forth around your fabric without lifting it. Ironing out wrinkles from your fabric before you begin cutting will ensure your pieces are the proper size. I find Best Press, spray starch, or steam extremely helpful when I have to deal with an especially stubborn crease. Now, pressing is entirely different than ironing. When you press, you set down the iron onto your fabric, press firmly for a few seconds, and then lift it up again. You do not move the iron around because a back and forth motion can sometimes stretch or distort your fabric pieces. Careful and thorough pressing throughout the construction of your sewing projects is critical if you want a professional looking finish. So, iron your fabric before you start, press between steps as you work your way through your pattern, and give your project a good final press when you’re all done! 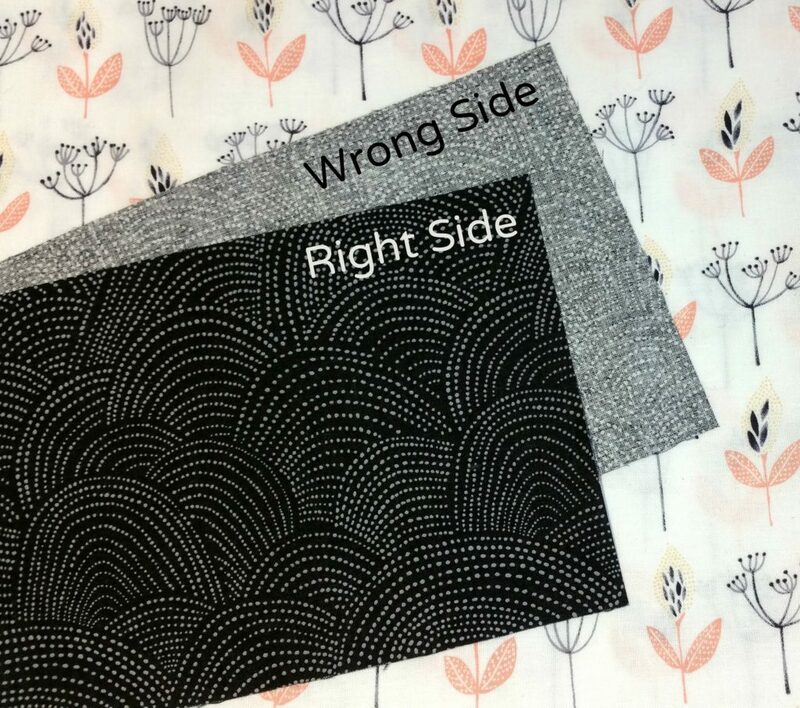 The right side side of fabric is the prettier side where you see the print design. So, when you sew “right sides together” or RST, the seam allowance ends up hidden away on the wrong side. Solid fabrics typically don’t have an obvious wrong or right side – they look identical on both sides. Can’t do without my glasshead pins from Dritz and my magnetic pin holder from Clover. Taking the time to pin before you sew is another one of those things that helps with accuracy, especially when you’re first starting out. 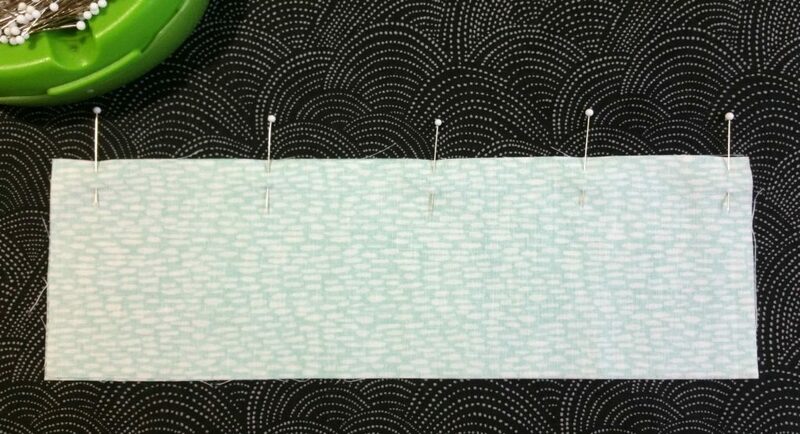 Pinning your layers together before sewing keeps everything nice and even and allows you to focus on your stitching rather than having to worry about keeping the pieces aligned. 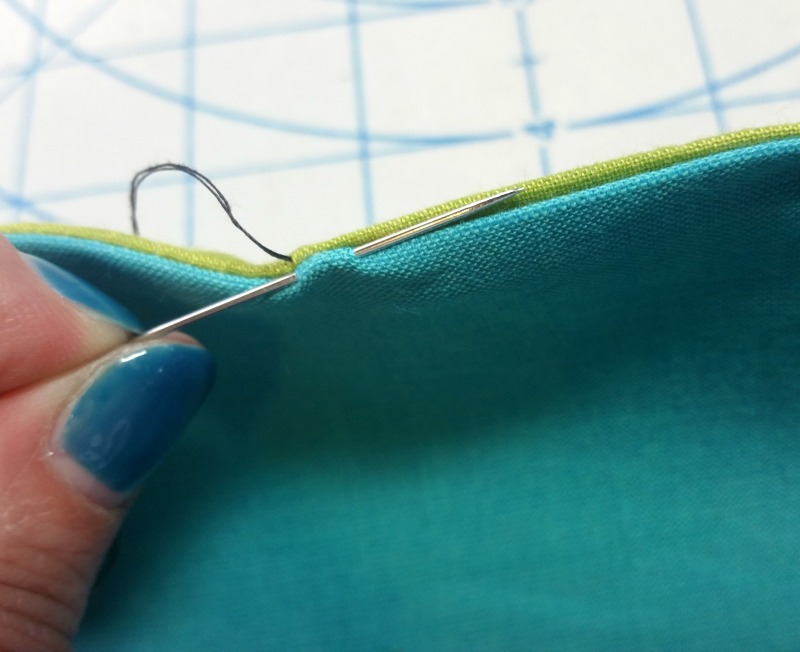 Make sure you insert your pins perpendicular to the edge of the fabric so they are easy to remove as you sew. And, whatever you do, do NOT sew over your pins! You could end up in a scary flying broken needle scenario and/or cause damage to your machine. When you sew two pieces of fabric together, the area between the stitches and the edge of the fabric is called the seam allowance. 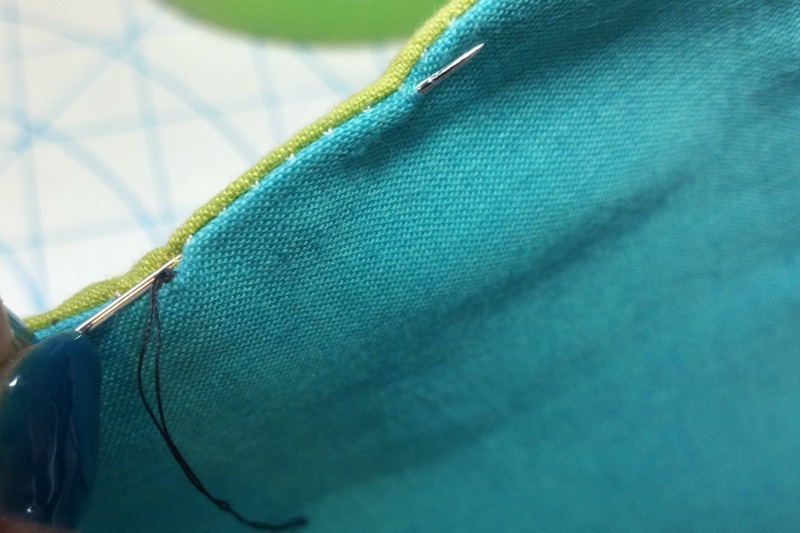 The more precise your seam allowance is, the better your pieces fit together. 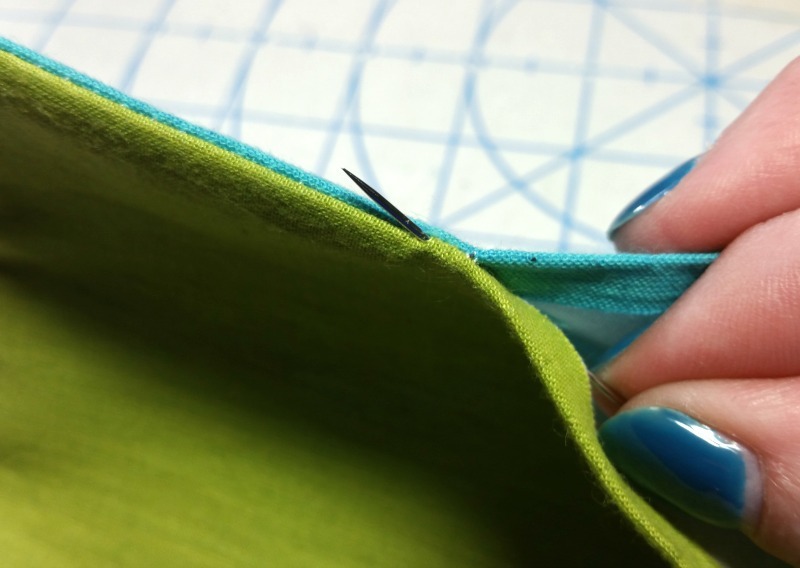 Seriously, do not underestimate how essential an accurate seam allowance is! 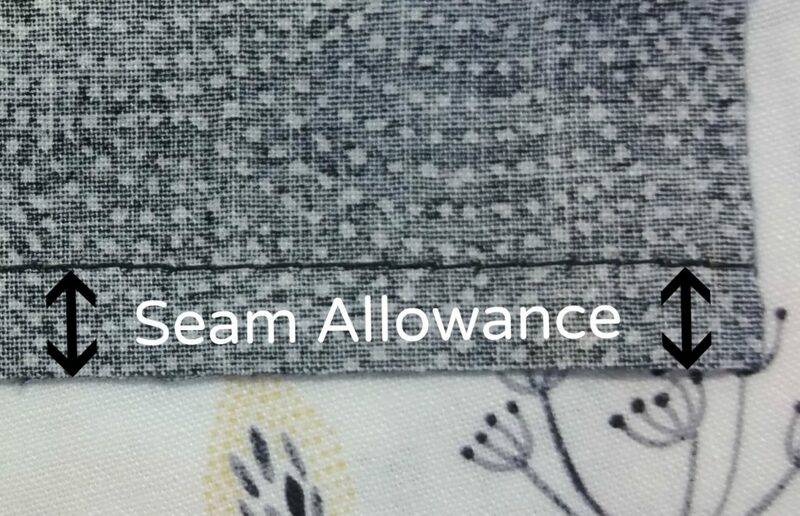 Take your time and do whatever you need to do to keep your seam allowance consistent. 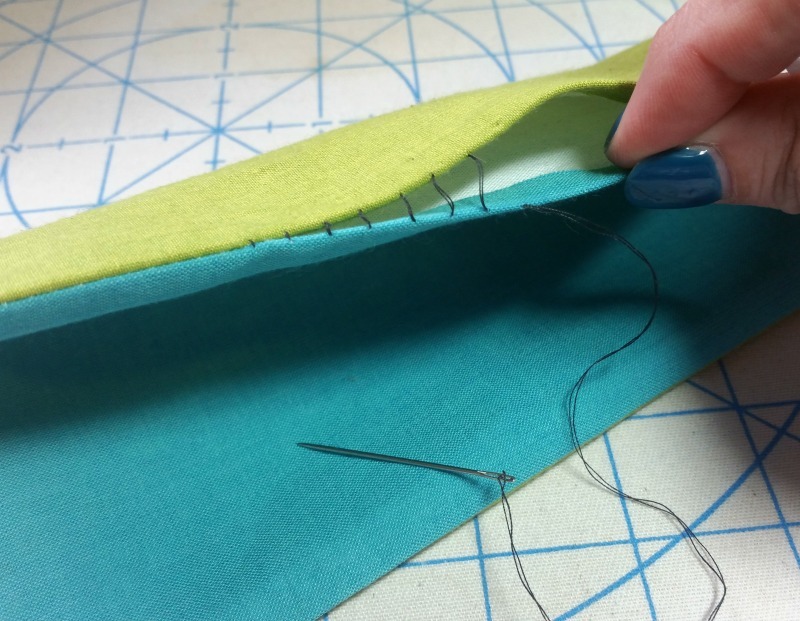 If you place importance on sewing straight and maintaining an accurate seam allowance, you will be happier in the end with your finished project. In my book, accuracy trumps speed any day of the week! 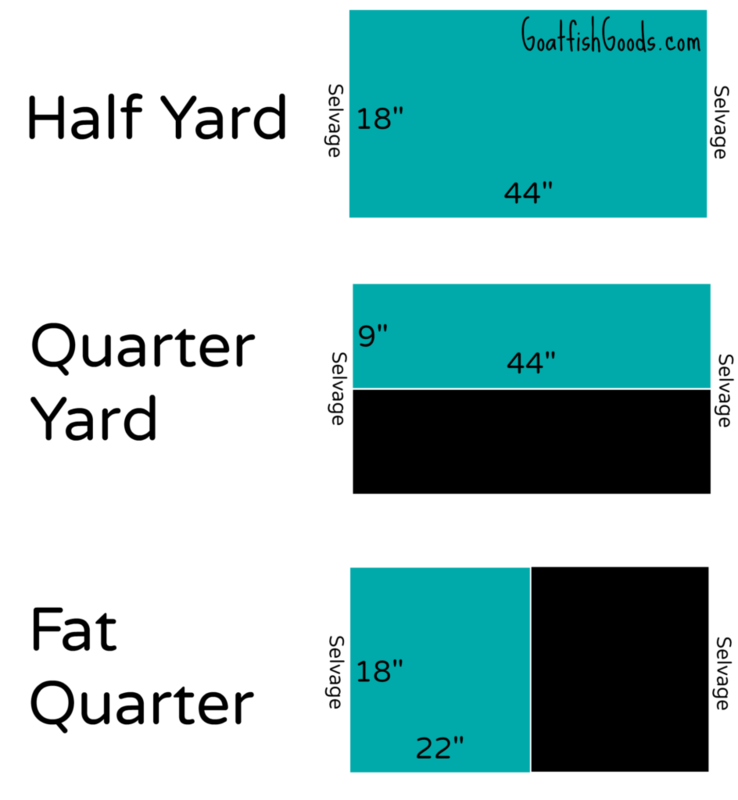 An average or default stitch length is somewhere around 2.5 mm. Basting stitches are long stitches, maybe 5 or a 6mm (or at your machine’s highest setting), used to temporarily hold layers together until the final row of stitches have been sewn. If basting stitches show once the project is finished, they can easily be removed. Topstitching is a slightly longer stitch, maybe 3mm or so. It can be purely decorative or it can be used to secure layers together (like stitching along a zipper or hemming a pocket edge). Backstitching or lockstitching is when you sew forward and backward a few stitches at the beginning and end of your seams to keep them from unraveling. Zippers have been known to intimidate a sewist or two. I’m here to tell you, though, they really aren’t something you should shy away from. After you’ve tackled a couple of projects with zippers, you’ll see how fun they are to work with and they won’t be at all scary! After you’ve picked out the perfect colored zipper for your project, be sure you test it out before any sewing takes place. Simply open and close it a few times. I can tell you from personal experience how sad it is to finish a zipper pouch only to discover the zipper is a lemon. If your zipper won’t lay flat because it was folded inside a package, you can try spraying it with a little water or Best Press and press it flat (with the teeth side down) using a pressing cloth. Be careful not to allow your iron to come into direct contact with your zipper or the teeth will melt! If you’d rather not have to flatten a zipper that is squished and bent, you should definitely check out the Etsy shop, Zipit Zippers. They offer a huge, colorful variety of zippers which are shipped flat without the pesky packaging. 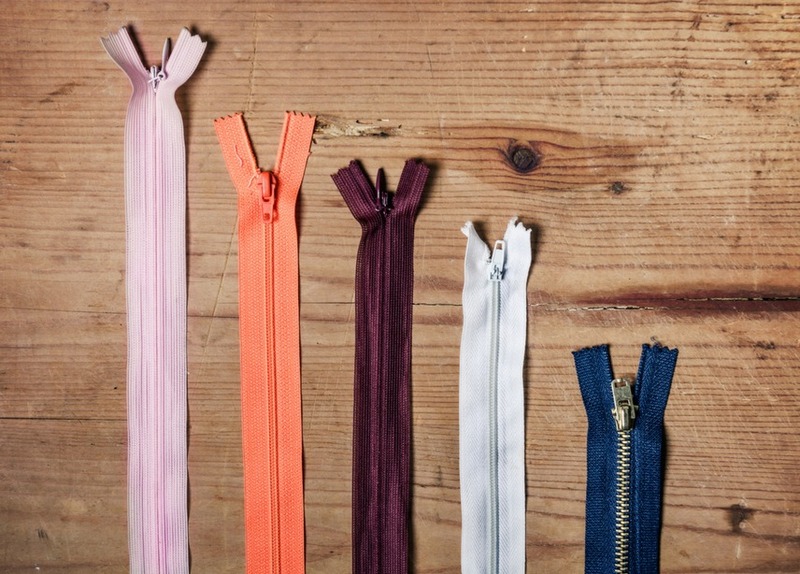 The owner, Jennie, has written a great post full of zipper tips and information titled Guide to Zippers. I use Shape Flex so often, I purchase it by the bolt when it goes on sale! Shape Flex by Pellon (SF-101) is a mid-weight fusible woven interfacing and it’s magical. When fused to quilting cotton, it gives a perfect amount of body or structure to the fabric without making it thick and difficult to work with. In other words, it keeps your bag from being all floppy like. On small bags, you can fuse it to either the lining or the exterior. Or, you may decide to fuse it to both. The thing I love most about this product is that it doesn’t make the fabric crunchy, dimpled, or wrinkly. It moves with the fabric… well, like magic. The bumpy side of Shape Flex is the fusible side with the glue. I place my fabric wrong side up with the interfacing bumpy side down on top of it. Never let your iron come into direct contact with the glue or you will have a mess on your hands. I spray it very lightly with water and, starting from the middle, I slowly press (not iron!) the interfacing away from the center toward each side. This prevents the Shape Flex from wrinkling. Once I’m sure there are no wrinkles, I start on one end and press for about 10 seconds before moving to the next spot, overlapping each area as I go. I let the fabric cool a bit before proceeding so I can be sure the interfacing is completely fused to the fabric before proceeding. The more bags you make, the deeper you’ll dive into the world of interfacing. 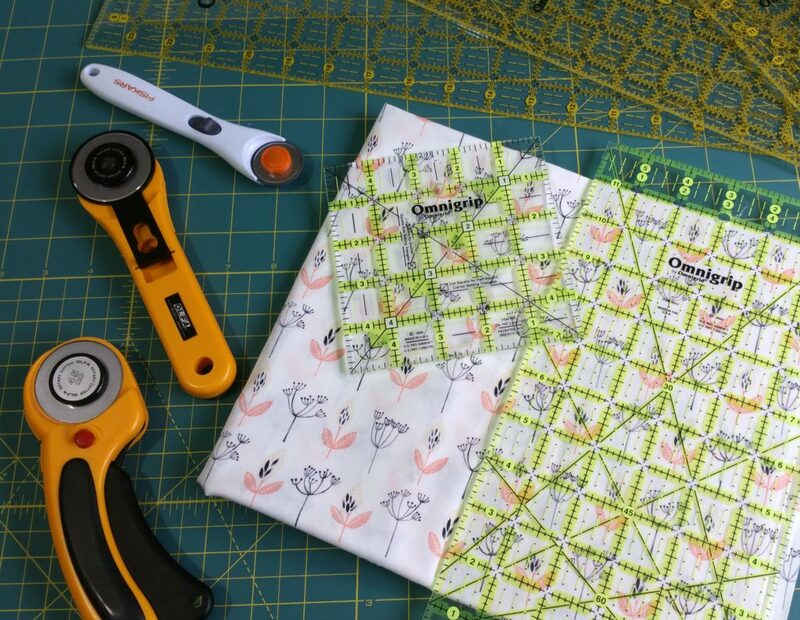 Sara Lawson at Sew Sweetness has written a super helpful guide called All About Bag Interfacing. If you don’t know her already, she’s one of the great goddesses of bag making. I highly recommend you check out her class Building Better Bags: Interfacing and Structure on Craftsy, as well as take a minute to browse through her shop where you can purchase her amazing bag patterns and supplies. 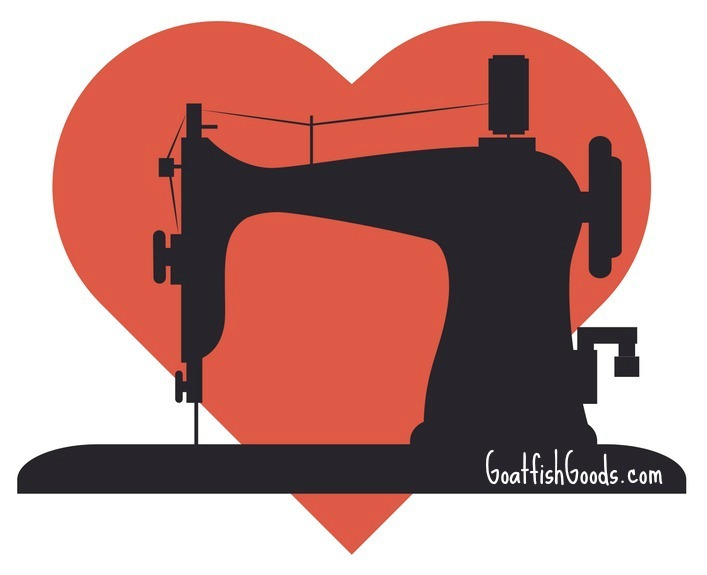 Unfortunately, you can’t sew and sew to your heart’s content without considering the maintenance of your sewing machine. Well, you can, but you’re likely to regret it. To keep your sewing experiences on the happy side, keep your machine covered when not in use and clean it between projects. Don’t underestimate the usefulness of your owner’s manual, but again, there are also some great tutorials you can take advantage of. Craftsy offers a FREE class called Sew Ready – Machine Basics that includes a lesson specifically on sewing machine maintenance. Aside from the regular cleaning you’ll need to do, it’s also a good idea to take your machine in to your local dealer once a year for a deep cleaning and an overall checkup. Change your needles often, too. They say to do this every 4-5 hours of sewing. I have a hard time remembering this rule, so I simply try to change it out every project or every other project depending on how extensive the construction is. Sharp needles make everything better. So… there you go! This list is a teeny tip of the iceberg, but what I’ve included would be the top things I’d share with a friend who is new to sewing. I hope you found it to be helpful! Please let me know if you have any questions. Oh, and if there’s a tip or trick you’ve picked up along your own sewing journey, please share! The fabric in these photos are all from the Desert Bloom line by Rae Ritchie for Dear Stella.